TechReady is Western PA’s leading Kittanning PA Computer Repair & Kittanning PA Computer Support firm. Contact us to purchase new, used & refurbished name-brand computers. Let us fix your computer issues with our fast & friendly tech-support. Our team can setup, install and manage your home or business network. We can fix your home or business computer over the phone in minutes. TechReady is a full-service technology firm offering Kittanning PA Computer Repair and Kittanning PA Computer Support to homeowners and businesses throughout Western Pennsylvania. Our team also offers computer sales, computer networking and remote support for ALL your Kittanning PA computer repair needs. TechReady’s team offers Kittanning PA Computer Repair & Kittanning PA Computer Support to Western Pennsylvania. 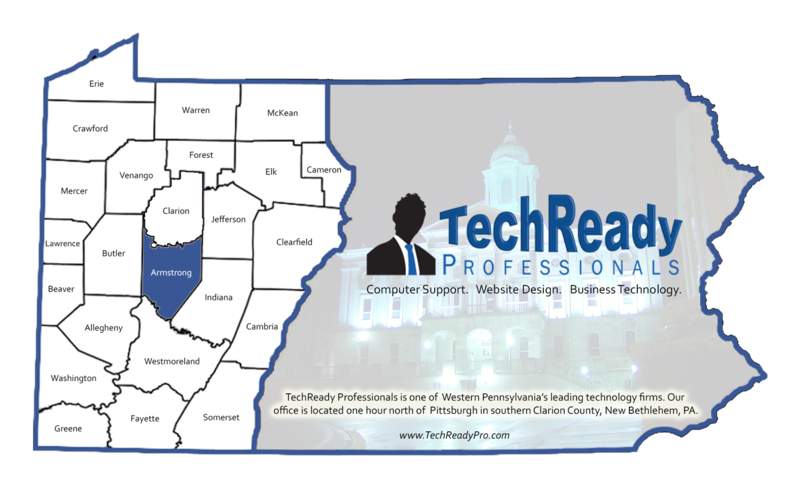 TechReady’s team of technology professionals serve Western Pennsylvania, including local homeowners and businesses with Kittanning PA Computer Repair, Jefferson PA Computer Repair, and Armstrong PA Computer Repair services. Additionally, our team offers Clarion PA Computer Repair and Brookville PA Computer Repair.